Tampons vs. Menstrual Cups? 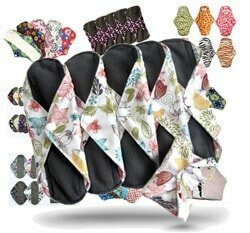 Disposable Pads vs. Cloth Pads? 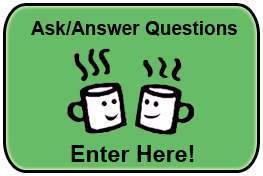 Home » Menstrual Cups 101 » Tampons & Pads vs. Menstrual Cups & Cloth Pads – What’s Right for You? With just about half of the world’s population being female, and every one of those women having to manage their menstrual cycles, there can be no doubt that how this is undertaken is a serious discussion. Take this in for a moment… a rough estimation gives us 3.5 BILLION women who will each have their periods for 30 YEARS or longer. Those numbers are staggering when you start to think about the feminine protective products in use and the amount of those that will end up in our landfills and trash heaps. Although sanitary pads have been in use for the longest length of time, the tampon was created in the 1930’s and has been a popular choice ever since. Unfortunately, both of these options are one-time-use and disposable, a very unfriendly choice for our environment. On top of that, a majority of these products tend to be made with materials that are full of harmful chemicals. The Chic Ecologist website states that, “According to the book Flow: The Cultural History of Menstruation, the average woman throws away up to 300 pounds of feminine hygiene related products in a lifetime.” They also note that a typical women can use anywhere from 8,000-17,000 pads/tampons in her lifetime. Several other resources supported the midrange of this number, about 10,000, as well. Try for a moment to visualize what 300 lbs. of garage looks like. That is for only ONE person. Here’s an image to help you. These types of overwhelming numbers and impacts on our environment give us good cause to take a look further into each of the menstrual management methods available, the pros and cons and what best works for you and your lifestyle beliefs. Sanitary napkins, menstrual pads, or just called pads, were one of the first forms of feminine protection and are still widely used today. 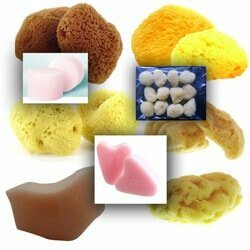 They come is a large variety of sizes, shapes, lengths, styles, and absorbency levels. Women may prefer pads because they are apprehensive of putting something inside their bodies or have fear about how other menstrual products work (such as cups or tampons). The Royal Institute of Technology in Stockholm did a study comparing the all the raw material, fossil fuel, and plastics that go into making tampons and pads, and by far sanitary pads have more of a negative environmental impact than tampons do. 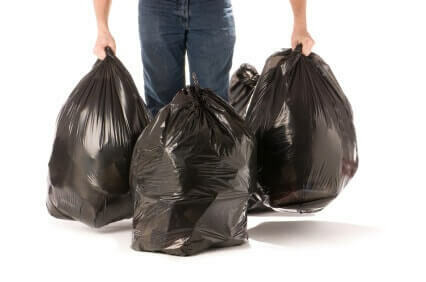 Of course the overall disadvantages to the environment are steep as the chemicals and plastics for these one-time use products end up in landfills. It also seems to be a consensus among women that pads are generally found to be uncomfortable and not suitable for many kinds of physical activities. According to a prominent study, tampons are the most popular choice of feminine protection for women under 41. Chosen for ease of use and greater physical freedom, tampons come in as many various sizes and levels of absorbency as sanitary pads do. 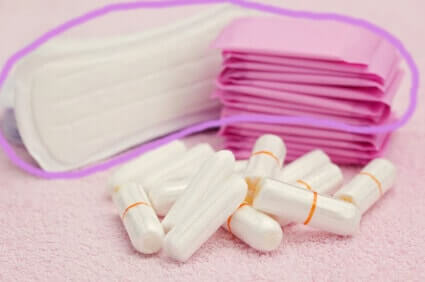 The bad news, in America alone an estimated 7 billion tampons are disposed of each year. Every single one of those products has an environmental impact of the waste of the product itself, as well as the packaging, applicators, and costs of transportation and production. The U.S. Department of Health and Human Services recommends changing tampons at least every 4-8 hours. This is one of the reasons tampon waste is so high. They also note that women who use tampons are at a greater risk for toxic shock syndrome (TSS) then those who use a pad or a cup. TSS is a rare but sometimes deadly disease, which is caused by toxin producing bacteria. The Food and Drug Administration (FDA) recommends the following tips to help avoid tampon problems. There is also some evidence that women who use tampons may have an increased risk of urinary tract infections. There are organic cotton tampons available to help women stay away from chlorine-bleached products, rayon and all the insecticides, pesticides and herbicides that are used in the growing of non-organic cotton crops. But while organic tampons may solve the issue of pesticides and bleach, they still inevitably cause waste. Although they have been around as long as other feminine hygiene products, menstrual cups are still not quite as widely known about or used as some of the other options. Just like their counterparts, menstrual cups come in a wide array of shapes, styles, sizes and even colors! Most are made with silicone, some made with latex, but all of them can be reused for many years before needing to purchase another one. Some of the drawbacks include difficulty when first learning how to insert and remove a cup but these challenges are solved with practice techniques and education about your own body and its make up. Click here to view our Top 10 Menstrual Cups. Another fantastic way to SAVE MONEY and go green are with reusable menstrual pads. They are just as absorbent, if not more so, than disposable pads, they come in soft and stylish options and are much more comfortable than your regular bulky sanitary pad. Because they don’t use toxic resources such as plastic and cut down on production costs, packaging and overall disposable materials, they add a minimal amount of waste to our environment. Click here to view our Top 10 Reusable Menstrual Cloth Pads. This video on “Cups vs. Tampons/Pads” has some great visual demonstrations and discussions to help you make the best choice for your body. With all the options for feminine protection, it’s important that we are educated about the alternatives so that we can better manage our menstrual cycle, choose the most healthy and toxic free options available and use our dollars wisely by supporting options and companies that work to keep our world a healthy one.